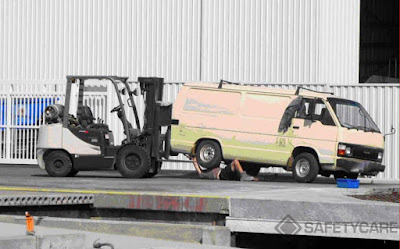 Workplace Safety Blog | Safetycare | Safety Training Videos | Free Safety Pictures and Resources: Yet another poor work practice involving a forklift! Yet another poor work practice involving a forklift! It's easy to see why Forklifts are a leading cause of death and serious injury in workplaces around the world. Pictures of unsafe (and we mean really unsafe) forklift use are not hard to find. Well, here is yet another! If you have forklifts in your workplace, make sure your forklift training and behavioural safety programs are up to date. It only takes a second, and a silly decision to potentially result in a fatality. Working at Heights: This isn't really working! Bad Housekeeping at its finest! 'I saw the sign!' - New to Safetycare's blog! Join us and subscribe to our Blog! Lifting and Carrying from the 1970's!